One of the things the Caribbean is famous for is Voodoo – Vodou in the preferred spelling of modern practitioners. The origin of dark magic, curses and walking dead, vodou has been used to spice up a variety of pirate movies and novels, most recently in Pirates of the Caribbean 4 – On Stranger Tides. But the truth is, perhaps even stranger. 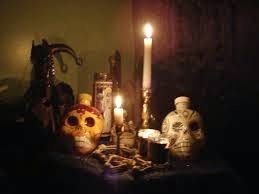 Vodou is a modern religion, and a religion of recent origin. 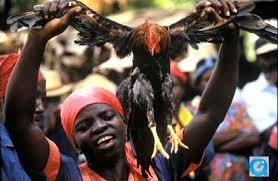 It grew out of the slavery of Africans in the 17th and 18th century. In short this ancient religion is very modern. It’s roots are in oppression, and it has been a unifying force for the various underclasses of the islands. The primary “flavors” of Vodou are Haitian, Jamaican, and New Orleans. We will be discussing primarily the religion of Jamaica and Haiti, for the New Orleans religion is substantially different. 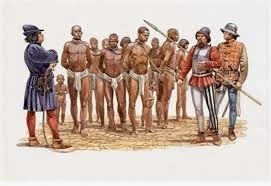 When the planters of the islands bought slaves, they made an effort to buy Africans from a variety of different tribes, cultures and languages. Their reasoning was simple. If the slaves did not share a common language or culture, it would be much harder for them to rise against their oppressors. The island planters, being more isolated from Europe and from other Europeans, felt especially vulnerable. The slaves had every reason to try escape or the overthrow the masters. Working on a sugar plantation was a death sentence. In the early days, slaves’ lives less than three years on average, and living conditions never improved much. Yet the horrible living conditions also provided an excellent reason to band together. Soon the slaves communicated in languages based off the languages of their overseers (English on Jamaica, French in Haiti) flavored with words from their own many languages. They also began to meld their religions. While many, many tribes were represent among the slaves, their religions often held common themes. Similar deities melded together. Folk traditions grew together. witchcraft, in addition to such things as “bad air” sin, and having too much blood. The emerging Vodou cults attributed sickness to the attentions of wandering ghosts, or such things as having a persimmon tree too close to the house. 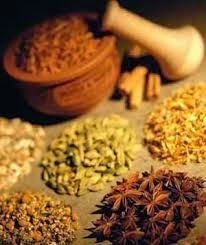 The African healers also met and learned from the last surviving members of the Native population, discovering how to use local plants and materials to create effective medicines. When the medicines did not work, these skilled healers used “spirit powers” to defeat the attacking ghosts and encourage their patients to get well. Was it the placebo effect? Was it magic? We may never truly know, but these healers and religious leaders won the hearts of the slaves, and began the creation of an underground civilization that made the situation almost bearable. Although Haitian Vodou agrees that there is only one Supreme Being, it recognizes many powerful spirit “deities” as well. These are the loa (or lwa) and are roughly analogous to the Catholic saints. 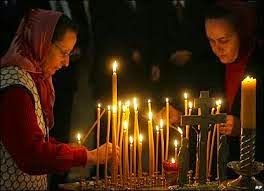 They each have their areas of power and protection, accept offerings and prayers, and intercede on behalf of their followers. Of course, all of this was done in complete secrecy. Slaves were required to become Christians, at least officially. In Haiti this mean being baptized as Catholic. However, one the baptism was preformed, the overseers were only concerned that an outward appearance of Christianity be upheld. Vodou made use of the cross, but found different meaning in it. For them, it was the sign of the crossroads, the place where life and death meet. 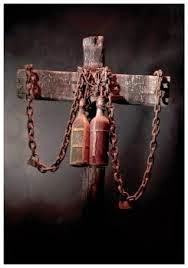 Often crosses were decorated with rum bottles, sign of joy, and chains, sign of the painful nature of a life without freedom. The Bokor, or priest/priestess of the lwa, disguised the lwa as Catholic saints. 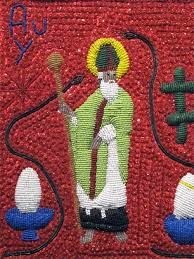 For instance, Damballa, the spirit master who created the waters and the earth by shedding his skin like a serpent is often represented by St. Patrick, who drove the snakes out of Ireland. Much of the work of the Bokors was spiritual healing. They called upon the lwa and made offering to them, gave patients and petitioners spiritual duties, and created alters and statues. 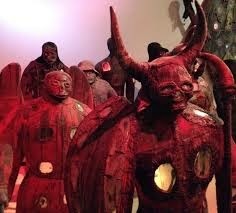 To the Western eye, these figures, along with their alters, appeared to be visions from hell. Several of the lwa bore snake aspects, so the representation of serpents was common. In order to show power, figures were often decorated with bull’s horns, giving them a devilish appearance. The colors of red and black appeared often. And, since Vodou incorporates aspects of ancestor worship, human skulls are sometimes used in religious art. Vodou was a religion of the persecuted. The slaves rose in rebellion, were violently put down and tortured in punishment, and rebelled again. Their religion, and their religious leaders, supported them. Some of the images became horrible. They had always looked crude, being the work of poor people who could not afford fine materials. But now they showed spirits who had suffered along with their worshipers. Protective spirts who had fought hard for the people might be shown missing hands, arms, legs, feet. Eyes were missing. The statues bore the chains of servitude. And yet the makers of these strange, powerful objects took one further step, which I find quite indicative of peaceful nature of the religion. They bound these frightful figures. The Bokor bindings were of rope. While chains showed strength to endure under oppression, ropes were a poor man’s binding. These were designed to hold back the destructive power until it was needed.